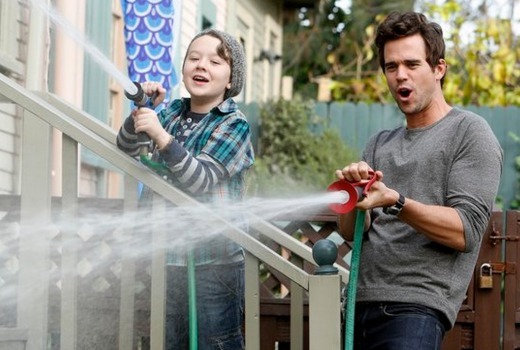 US comedy series About a Boy will premiere on FOX8 later this month. Starring David Walton, Minnie Driver and Benjamin Stockham, this is a small-screen adaptation based on the novel by Nick Hornby, which was also the basis on the 2002 film starring Hugh Grant. There are two seasons of this, which premiered in the US in February 2014, but last week NBC confirmed it was not proceeding to a third. There are at least 27 episodes, and possibly another 6. Based on the best-selling novel comes the series “About a Boy,” a different kind of coming-of-age story. Will Freeman lived a charmed existence in San Francisco. After writing a hit song, he was granted a life of free time, free love and freedom from financial woes. He’s single, unemployed and loving it. So imagine his surprise when Fiona, a needy single mom and her oddly charming 11-year-old son, Marcus, move in next door and disrupt his perfect world. When Marcus begins dropping by his home unannounced, Will’s not so sure about being a kid’s new best friend. But before he realizes it, Will starts to enjoy the visits and even finds himself looking out for the kid. In fact, this newfound friendship teaches him a thing or two that he never imagined possible – about himself and caring for others. Mondays from June 1 at 7.30pm on FOX8. I like the show, shame it’s not continuing in the US. This show started off alright with some funny moments and entertaining episodes, but after a quarter of the way into season two it just went rapidly downhill to the point it was just rubbish.